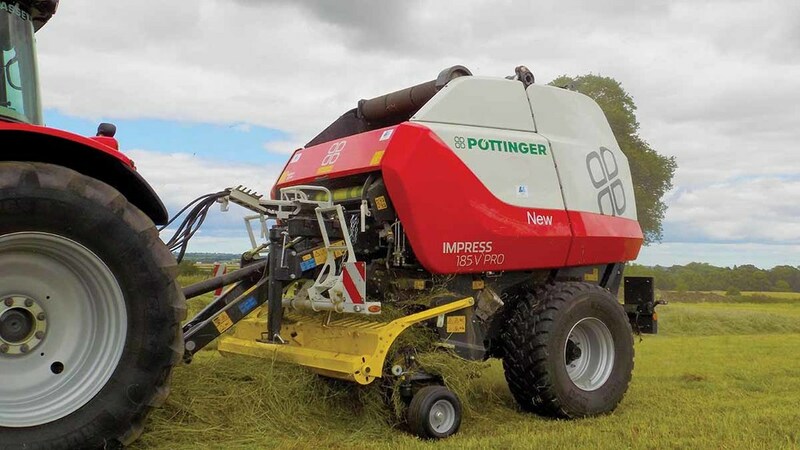 Now in its final stages of evaluation, we take a close look at Pottinger’s Impress round baler. 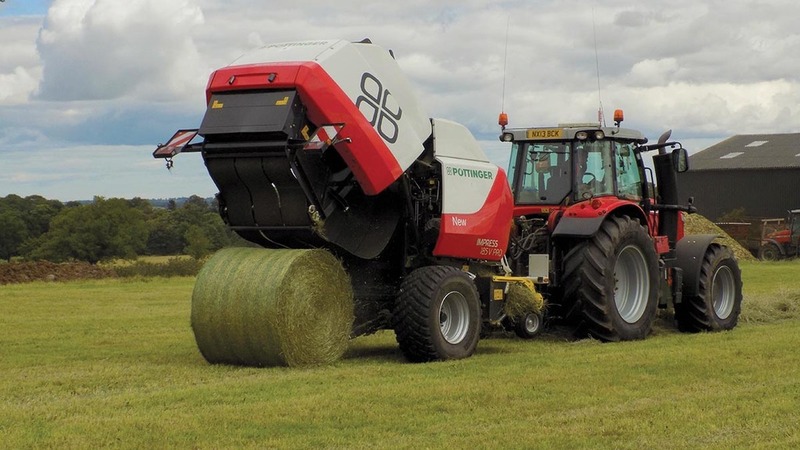 Having first revealed its Impress round baler concept to the press in 2014, Pottinger is now starting to roll out a limited number of demonstration machines across Europe. 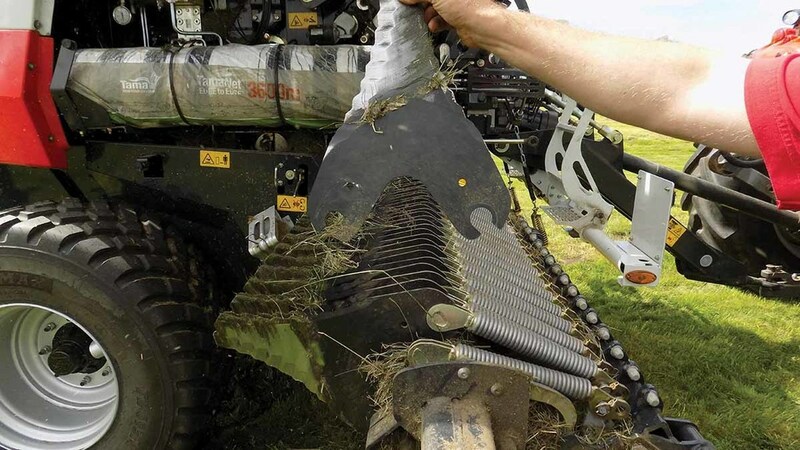 At the heart of the new baler is a novel up and over feed rotor design said to produce a more natural flow of crop and offer much better access to knives. Initial model offering will be the 125F fixed chamber baler and the 155V and 185V variable chamber balers. Both the fixed and variable chamber versions will be available in two specification levels; Pro and Master. Top-spec Pro models will be available with 1,000rpm pto, load-sensing hydraulics, 32 knives, 2.3 metre pickup and are IsoBus compatibility. For something simpler, Master models get a 540rpm pto, 16 knives and a 2.05m pickup. 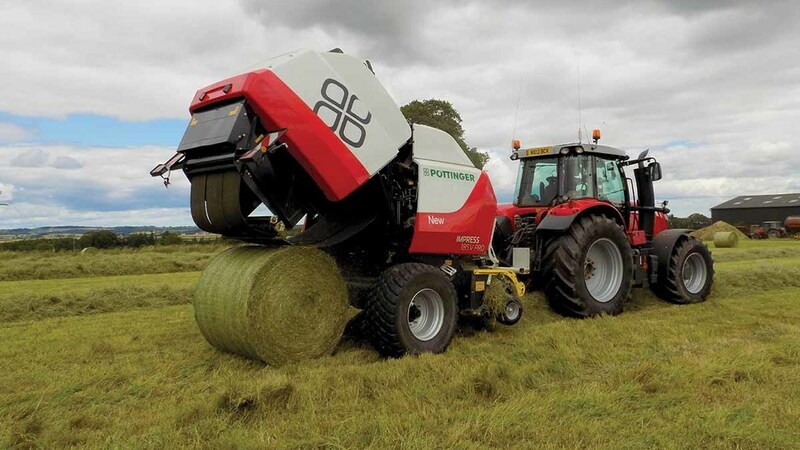 The range will eventually include combination wrapper versions of the balers, featuring Pottinger’s own wrapping unit. To see how the Impress copes with UK conditions, we caught up with a 185V Pro and introduced it to a variety of crops. Taking several design cues from its range of forage wagons, the 2.3m pickup is a five tine bar design running in cam tracks. In addition to moving up and down, the pickup can also pivot left and right, offering 120mm of vertical travel at either end. This really helps follow contours and was well tested in one of our fields which looked like a reclaimed mine field. Pickup working height can be adjusted via its jockey wheels or set to one of eight ‘floating’ positions for straw, preventing the pickup dropping down any ruts, etc. Jockey wheels are also within the overall transport width of the baler, so no need for removal. Keeping crop pressed onto the pickup is a combination of a roller and the fattest crop press tines you have ever seen. Coupled with two pairs of contra-rotating augers, crop is competently fed to the feed rotor. As mentioned, the feed rotor on all Impress balers rotate backwards, sending material up and over it, through the knife bank and into the chamber. Looking at this layout from inside the chamber, you can clearly see an almost uninterrupted path for the crop to flow, which should help in trickier conditions. Using the baler on its own, it is quite hard to tell if this feed method makes much of a difference to crop flow, but it did cope well with a variety of crops from short sticky silage to heavy swaths of barley straw. For some shorter material, this can occasionally fall forwards from the feed rotor and roll between it and the pickup. This only really has a tendency to momentarily happen when the baler is pointing downhill. Unconventionally located above the feed rotor is a bank of 32 knives offering a theoretical chop length of 36mm. By sliding the knife bank out to one side of the baler at waist height, maintenance access is excellent. It also allows you to configure the knife bank to pretty much how you like it. With half the knives manually selected via one shaft and half via another, you can quickly switch between two lots of 16. Knives are also double sided, effectively giving you use of four lots of 16 before they need to be sharpened. In addition, you can select no knives, four or eight, and the whole knife bank cab be engaged/disengaged from the cab. Knives are also sprung-loaded for protection against foreign objects. 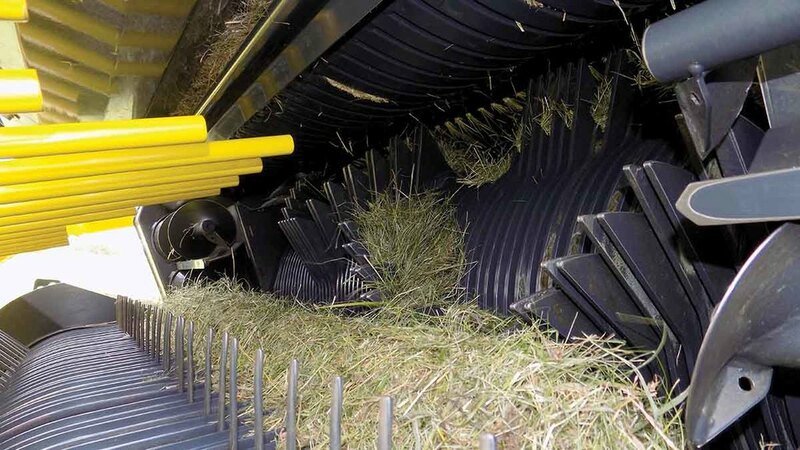 Should a blockage occur, the knife bank and roof of the feeder housing can be raised, essentially opposite to how a drop floor works in a conventional round baler. If baling straw, for instance, the position of the knife bank means no blanking plates are required as crop falls away from the knives. Two control options are available for the 185V Pro including the firm’s Power Control unit and the universal CCI 100 terminal. As the baler is IsoBus compatible you can also use it with a tractor’s terminal. This allows you to assign some of the baler’s functions to the tractor’s buttons or joystick, particularly useful for often used functions, such as when using the pickup. Failing this you can use the baler’s controller for everything, but it is not quite as convenient. This said, the CCI 100 terminal we used for the test is easy to navigate and clearly shows bale status, wrapping status and number of bales produced. Through the terminal you can alter bale size and bale density in three zones – the bale core, middle zone and outer zone. You can also save six baler settings for different crops. As for the wrapping process, the baler can be run in three modes – manual, customised and fully automatic, the last of which sees wrapping start/stop and tailgate open/close controlled automatically. At the start of this process the baler will even lift the pickup and put it down when the bale is wrapped; a handy feature if you are reversing the baler to drop the bale. Another smart feature is the tailgate, which starts closing immediately once the bale has left the ramp. This avoids it having to open fully every time you drop a bale, saving time. Manual mode is as it suggests, while custom mode allows you to automate certain elements while still having manual control over others. For the most part, fully automatic is the one to use. Would it actually feed properly? This was our main question about the Impress. And yes it does. Whether it feeds much better than a conventional round baler is hard to tell. In theory crop should flow more naturally. 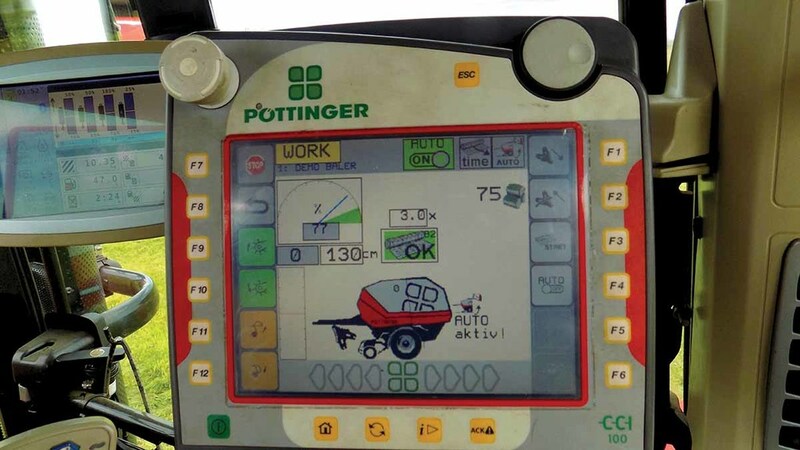 If nothing else, Pottinger certainly has a USP to shout about. A more tangible benefit of the unconventional layout has to be the knife bank access, which is unmatched by any other make. Coupled with the pivoting pickup and smart automation, this baler has a lot going for it. If anything could do with working on it would be the insides of the panelling, which have a habit of collecting dust and debris and then depositing it on your head when opening the panels. Similarly, there are quite a few spots round the baler for dust and chaff to build up on. Overall though, it is a good first effort and we look forward to seeing the combi versions.